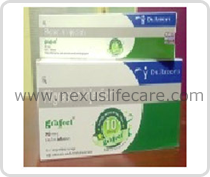 Uses:- Grafeel Injection stimulates the production of white blood cells. Grafeel Injection is prescribed for neutropenia. Grafeel Injection is also used to decrease the incidence of infection in cancer patients who are under chemotherapy treatment or a bone marrow transplant. Side Effects:- Musculoskeletal pain, bone pain, hypersensitivity reactions, spleen enlargement, hepatomegaly, thrombocytopenia, anaemia, epistaxis, headache, nausea, vomiting, diarrhoea, urinary abnormalities (dysuria, proteinuria, haematuria), osteoporosis.